Hoadley in a Lemon Tree, originally uploaded by Eric Jeschke. One of my “chestnuts”…and a cat picture, no less! Nevertheless, I consider it to be one of the best photographs I ever stumbled into. 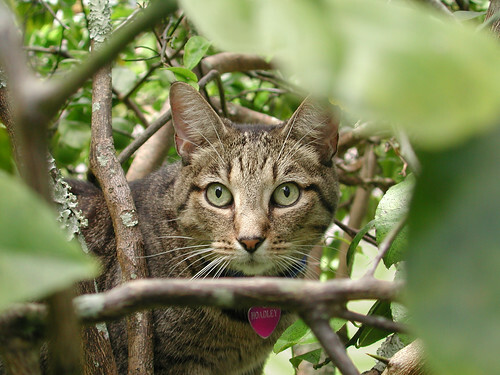 My cat had just climbed into a lemon tree and was peering out through the branches. Sensing a photograph in the making, I ran and grabbed my camera and framed him quickly through one of the openings, catching his face in a kind of natural frame of the branches and leaves. The autofocus was dead on. The print looks best LARGE. Even though this was a 3 megapixel image, I have printed it to 20×30 and it looks great! Hanging on the wall, his huge head is gazes out impassively and alertly. Most people have commented upon seeing it on my wall. This was one of several images that hammered home the point to me that the subject is as important as anything else in determining how large you can print. Other subjects that I shot in better light with the same camera would barely print acceptably at 8×10. And the face has fine details too: whiskers, hair patterns, etc. Very interesting. There may be something about the brain seeing the out of focus areas and contrasting them to the fine detail in deciding what looks sharp. This print, like many others, is available at a reasonable cost. Please check out the prints link.